Unlike Italian Cheese and Italian Pizza, Italian Thrash isn’t smooth and tasty, it’s filled with rage, filth and quality riffs. Yes, I said it (you can read that again!). But seriously, Italy along with its neighbouring countries, has become the new breed of quality Thrash bands, like IRREVERENCE, BLINDEATH, SOFISTICATOR, etc. These Italian Thrashers 2nd full length “The Pound Of Flesh” is a very 2015 style album, but is good enough to please even the old school Thrash conservatives. Starting with an intriguing intro of 1:24 min, which was surprisingly pretty good, giving an elongated sharp riff piece with no drums, the album ‘actually’ takes off with “Downers”. Like many other modern Thrash bands, TOTAL DEATH depends heavily on the dream beats to sync the loudness with the guitars, which works really well, and great credit has to go to the man behind the drum kit - Alessandra Mossi. The band uses tempo building beautifully, which is exhibited in songs like “Haunted” and “Morphine“. The complex technical riffs demands more attention from the listener as many riffs are hard to comprehend and air-guitar to, and stretch the boundaries of technical Thrash Metal, something not often off late. It’s a pleasant site to find because, new bands are not afraid to explore new untouched paths and create meaningful music out of sheer creativeness. The picking and shredding is top notch and impeccable. The music in this album tells me that the band has been heavily influenced by technical Death Metal and has tried to implement it here and has tried to make it sound like Thrash, which they have nearly succeeded. The bass is excellently used like in the intro of “Haunted”, and works great with the guitars. The dirty thick vocals of Paolo Azzimonti (who is also one of the two guitarists) is great on the ears, though nothing innovative for this day and age. “Four Walls - The Black Perfection” has to be my favourite song of the album due to its comparatively easy riffs, which helps me to air-guitar along to the main chorus riff. It’s hard for me to describe each and every song here, but I can guarantee that there are no weak songs in here. The album ends with an aptly named song for the album artwork “The Pound of Flesh”, which is another song filled with crazy riffs and constant blast beats. The ability to bring both mid temp and high tempo together and shower it with plethora of crazy technical Thrash riffs make “The Pound Of Flesh” stand out among the crowd. While the album isn’t anything close to a classic, but I see this style of Thrash becoming a trend, and THIS is actually good, for connoisseurs of riff based Thrash like me! 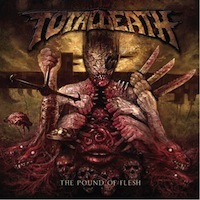 I haven’t listened to TOTAL DEATH’s debut album, but if this album is anything to go by, this band can easily be the future face of Thrash Metal. Thrashers rejoice, 2015 has started in a right way!